If you’re considering Us Work Visa Types, you’re usually considering coming to the US to visit, to work or to study. Therefore, you are not moving to the United States forever. When looking through the various types of visas, the first thing that you see is considering visas is like looking at a bowl of alphabet soup, all the visas start with a letter of the alphabet, and only a few letters are not used. Some letters are designated for particular circumstances that are quite rare, so this guide will not discuss them. But, the most common visas permit people to come to the United States for business or visiting, to work or to study. To visit the United States you would use either the Visa Waiver Program or the B-1/B-2 tourist or general business visa. 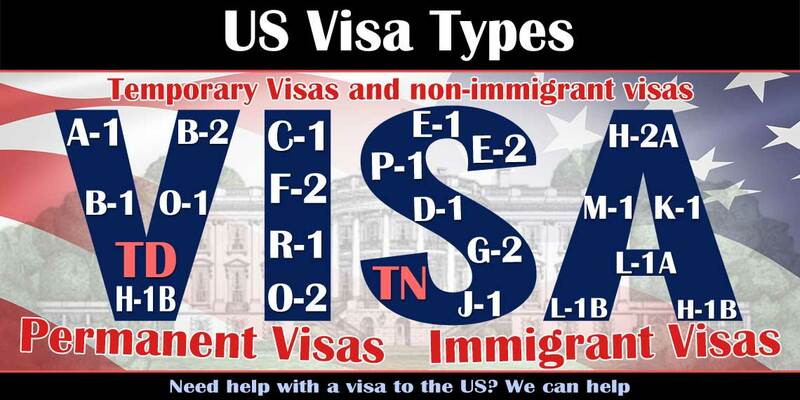 There are Different Types Of Us Visa Perhaps you have outstanding ability in the sciences or the arts. You would be on the H visa if you were a professional or a temporary worker, in general business or agriculture. You could also be on an L visa when an overseas division of your company transfers you to the United States. If so you would be on an O Visa. If you were an athlete or an entertainer, you would have a P visa. To come here for work, you could be on an E visa if you were investing in the United States or trading with your home country. Most people who come to the United States to go to school are on the F student visa. Those attending vocational schools use the M visa. Sometimes people come to the United States to study as exchange visitors and use the J visa program. Below is the table is the most common Us Non Immigrant Visa Types. Each letter links to an article specific to that US visa type. Each article discusses the purpose of that particular US visa type, and the requirements for filing for and receiving the visa. If information about US Visa types is useful to you, you may find related information on the process for US visa application, entry into the United States, the I-94 admission record, visa extension, extension of stay in the United States, change of status useful. If you have been denied a visa, need information on waivers of admissibility we will help you, along with our discussion of humanitarian parole. Lastly, if you are leaving the United States we have an article on potential problems. Do you need help in reviewing US Visa types to select the right one for you? We recommend having one of our strategy consultations. In the consultation we go over your facts and circumstances and relevant US immigration law to work through with you the best fit for a visa. If this sounds interesting to you, please contact us.